← So where is WHS Harmonisation at? What do I need to do when an employee sustains a work related injury? A worker being injured at work is a very stressful experience for everyone concerned. If you are a client of Aurenda, www.aurenda.com ring us on (08) 6389 8900 and we will do everything for you. 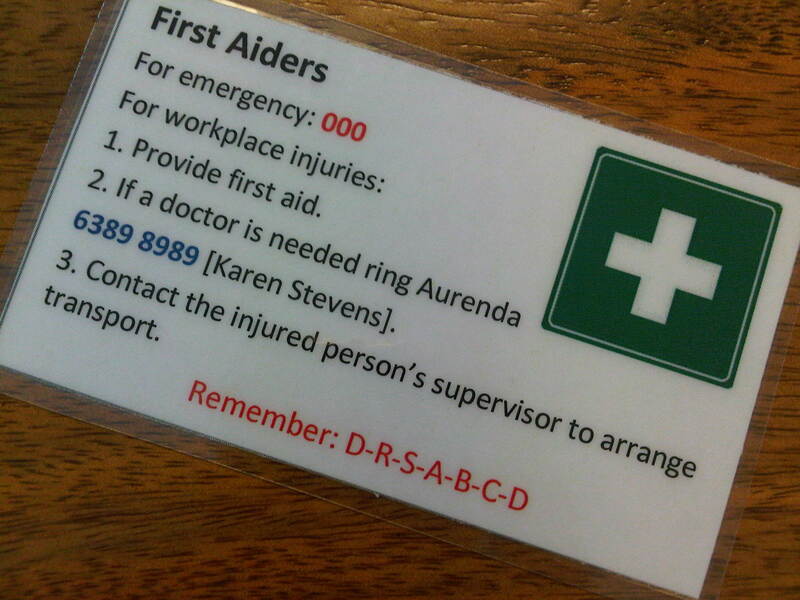 Just like this company that has our number of their First Aid lanyard. Initially you need to get them appropriate medical care. When they are seen by a doctor they need to get the First Medical Certificate (FMC). You legally have to provide them with a claim form which you can get from your insurer or you can download it from the WorkCover website. That claim form has to be filled in by the employee and nobody else and has to be signed by him or her in three separate places. You have to make sure they sign it appropriately. Part of the claim form is the Employers Report of Injury (ERI) form. It is very important that it is filled in the employers own words, don’t just repeat what the employee has said. Both the FMC and the ERI form have to be lodged with your insurer within five working days of you receiving the FMC from the employee.